Everything DIY strikes me as funny because whatever calls for DIY, I don’t want (IDW) because I’m dumb at DIY (DADIY). Cryonics seems pretty funny to me too. (I apologize to those who are currently on ice or waiting to be frozen at a later date – it’s just me. I'm sure there's a lot of validity to this. Well, I'm not really sure, but maybe you are). Isn't it interesting how one conversation leads to another? This all started with a discussion one evening about how much TV shows have changed. TV shows…led to animation…led to Walt Disney and VOILA! We ‘re closer to the topic at hand. Disney died December 15, 1966 and the rumor started that he was put in a deep freeze chamber under the ride “Pirates of the Caribbean”. (Pretty good rumor - wish I had started it myself). This story was new to me so I checked because if Disney is coming back, I’m buying tickets to Disneyland! Well apparently this story isn't true, at least not if you believe the death certificate, burial plot information and all that sort of official gobbledygook they have on Uncle Walt. (Snopes pretty well covers it all). Frankly, the whole idea of Cryonics seems kind of weird to me. For one thing, why would you want to come back in an old body? According to the Cryonics Institute (uh-huh), the oldest person on ice is 100. So, some day he’ll be thawed, cured, and be 100 years old. No thanks. Or, maybe he’d come back, get his lungs repaired (as an example), and then have a heart attack. Back to the cold? This could go on for a very long time. Eternity even. May as well just die and save everyone a lot of bother and expense. DIY Cryonics. HA HA HA! I didn’t log in to any of the sites (and there were more). Guess I’m not as curious as I thought. All I can say is if you’re planning on doing a DIY chamber, you’d better make sure you have a DIY back-up plan when it comes to power failures. I’m glad the whole Disney rumor is false. 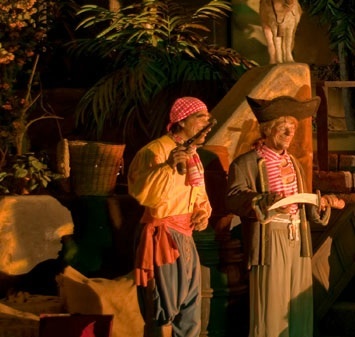 I’ve already been to Pirates of the Caribbean in California and if I ever see Pirates of the Caribbean again, it will be at Disneyland Paris (formerly Euro Disney). I just had to get a Paris reference in! P.S. The most famous person to have his remains frozen cryonically is (or was - I'm not sure), Ted Williams who played for the Boston Red Sox. P.P.S. If you're into Cryonics, that's cool. (Oh, sorry). There's a LOT of information on the web. P.P.P.S. Cryonics people don't have to write to me to tell me I don't know what I'm talking about. I'm well aware of this.